NYC Foodie Girl: Ahoy There, NYC Foodies! I've lived in NYC now for 10 years. So trust me when I say, it's a wonderful, rare occasion where I can truly be a tourist for the day in my own city! If you follow my Twitter feed, you would have seen a play-by-play of the tour. 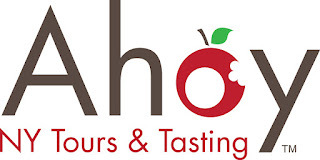 If you didn't get a chance to see, PLEASE take a look at a fun and incredibly tasty idea to spend some time exploring this great city with Ahoy NY Tours & Tastings - they have a lot of different options to check out. Oh! And know that I'm also working on a new PODCAST (which includes more info about my experiences with the tour!) for this website and am working on some technical issues - so stay tuned! The food was always great, I think they just updated their menu and it's off the hook. Who would expect delicious pizza at such big events. Not me, but you can get some of the best pizza at venues in Chicago here. The best place in this area.